As I was finishing my translations of Horace and Tibullus, I started thinking about my next project. I slowly realized that I was about to make the same mistake that most classicists have made for generations: fixating on one hundred and fifty years of Latin poetry, but ignoring the fifteen hundred years after Seneca, Juvenal and Martial. Accordingly, I started reading texts about which I had heard little or nothing. I discovered that Late Antiquity, sometimes still regrettably derided as “The Dark Ages,” was filled with marvelous and important verse that had not been translated into literary English. I soon settled on Saint Aldhelm (ca. 635-709 AD), sometimes known as “the first British man of letters,” as my initial project outside the classical era. Aldhelm had attracted attention from philologists and historians, but not many translators or literary scholars. Aside from being a key figure in the re-evangelization of Britain in the seventh century, he was a pivotal figure in the transition of Latin poetry from unrhymed quantitative verse to accentual rhymed verse. I consider his Carmen rhythmicum, a rhymed octosyllabic poem of two hundred lines about a violent storm, to be the first significant medieval poem. It is not a hymn, but it uses both end-rhyme and accentual meter—probably due to the influence of Saint Theodore of Tarsus, with whom Aldhelm studied at Canterbury. Unlike previous Latin poets, Latin was a second language for Aldhelm. Scholars have often relied on that fact to mock Aldhelm’s prosody rather than to celebrate its innovations, but Aldhelm knew what he was doing—he wrote an important treatise on Latin prosody called De metris. When he deviated from classical prosody, it was almost surely an intentional esthetic choice. It is undeniable, however, that, despite Aldhelm’s immersion in the classical tradition, the rhythms and sounds of Old English poetry flavor his Latin verse in novel ways. Sometimes in the Aenigmata one can even hear a break like an Old English caesura between two pairs of alliterated words. Old English poetry’s penchant for end-stopped lines may have also pushed Aldhelm toward what Emily Thornbury has called “stichic” lines. Another influence on Aldhelm’s prosody and vocabulary, Irish poetry, is controversial among scholars. Until the arrival of Theodore of Tarsus and Hadrian at Canterbury in 669 AD, Latin had largely disappeared from Britain. In Ireland, however, monks had developed a unique Latin literature almost entirely uninfluenced by continental Europe. Somehow the nonreligious books the monasteries owned were almost exclusively grammars and commentaries on classical texts. In other words, they parsed scholarship about Virgil, but had no access to the Aeneid or Virgil’s other works. In the Hisperica famine, the Altus prosator, and the almost indecipherable works of Virgilius Maro Grammaticus, the Irish developed a strangely “hermeneutic” style of writing that, unsurprisingly, would enthrall James Joyce with its puns, verbal creations, obscure allusions, and showy wordplay. Although there is some academic debate about Aldhelm’s education, it is likely that his family—which was probably a royal family—needed to import an Irish monk to Britain in order to teach him Latin. Despite this early exposure to Irish learning, Aldhelm had a strained relationship with his Irish peers. Moreover, Irish theology went off in its own direction for decades, which irritated Aldhelm enormously. In particular, the tenacious adherence of the Irish to a heretical method of setting the date for Easter stirred more rancor than most contemporary minds can fathom. While Lapidge is clearly right that Aldhelm had an impressive knowledge of classical and non-classical continental literary texts, it is a mistake to overlook the influence of the Irish poets. First, Aldhelm occasionally shifts vowels in ways that match unique vowel shifts in Irish writings. Second, Aldhelm uses unique vocabulary from Irish texts. Third, Aldhelm’s prolific punning and his use of both an acrostic and a telestich in his praefatio to the Aenigmata feel more inspired by Irish hermeneutic poets than by identifiable continental poets. Since translation is always a form of interpretation, I needed to learn a lot about Anglo-Saxon Britain—its medicine, politics, religions, and food among other topics—in order to translate Aldhelm’s riddles accurately. Most of the scholarship had focused on just a few of the riddles, so I ended up writing the first commentary on the Aenigmata more out of necessity than scholarly ambition. Latin poetry relies heavily on allusions to earlier poetry, and Aldhelm may have been more allusive than any poet writing in Latin before him. A few scholars had done an outstanding job—mostly in the 1990’s—of finding echoes of the most predictable poets, such as Virgil, Ovid, Symphosius, and Jerome, but when I started my work subsequent scholars had not updated this research with the new tools for searching texts. As a result of these new tools, I was able to identify some new instructive parallels. Aldhelm also had a taste for non-canonical travel poems (he travelled once to Rome but there is no evidence of other travel outside of Britain) and compilations resembling almanacs which few scholars study seriously today. His riddles echo such works as: Festus Avienus Ora maritima; Priscian Periegesis; Justinus Epitiome; Solinus Mirabilia; Valerius Maximus Facta et dicta memorabilia and perhaps Rutilius De reditu suo. The Aenigmata also echo Laterculus Malalianus, which Jane Stevenson has—correctly, I believe—attributed to Aldhelm’s mentor Theodore of Tarsus. Aldhelm found regular inspiration for “answers” in Saint Basil’s Hexaemeron and in some version of the anonymous Physiologus. Other religious poetry unappreciated today was also important to Aldhelm. For example, scholars debated for decades whether the phrase fata reorum in Riddle 69 was a scribal error without noticing that it appears in Vita Martini by Paulinus Petricordiae, a book Aldhelm echoed several times. Aldhelm’s treatise on prosody is our only source for a few lines of Lucan’s Orpheus, and I sometimes found myself wondering whether certain striking and seemingly original lines in the Aenigmata might be distant reflections of that lost Lucan text. Aldhelm also cites Aristotle as a predecessor who used riddles to achieve serious goals, but his likely sources for that opinion are apocryphal. Pendeo nec caelum tangens terramve profundam. Dum lattices limphae tolero flammasque feroces. Note the alliteration in four of the five lines, and two pairs of alliterating words in the final line, which accentuates its “punchline” effect. I hang, ugly, round, large, made of beaten metals, neither touching the sky nor the vast earth, heated by fire and seething with water. Thus I endure these two oppositions with their various dangers, as long as I put up with the liquid of the water and the fierce flames. I hang, touching neither the sky nor the deep earth. As I endure the surging of water and the ferocious flames. Note how radically differently these translators render their third lines despite being freed of the constraints necessary to express the line as poetry in English. The first person to attempt a “literary” translation of the Aenigmata into English was James Hall Pitman. At the time of his translation Pitman was a young scholar who helped bring attention to Aldhelm with his 1920 Yale University Press edition. His notes and translation, while often problematic, nonetheless raised important questions and advanced Aldhelm scholarship. He opted for blank verse translations, but could not maintain line-for-line equivalence; his translations tended to respond to the complexities of the translator’s challenges by simply making them much longer than the original—even though stretching out humor invariably makes a joke wear thin. The limpid waters and ferocious flames. Although Pitman generally avoids alliteration the way that classical scholars were conditioned to do in this era, he does punctuate the final line with “ferocious flames” (even though a strict Anglo-Saxonist would not call these lines alliterative). Seething with billows and aglow with flame. By both these raging elements at once. You can see that Wilbur chose to use end-rhyme in his versions, a choice which I followed for the following reasons. First, one should rhyme translations of riddles because in English poetry riddles are wedded to a light verse tradition that has relied on rhyme to enhance humor. The riddles of J.R.R. Tolkien and other fantasy literature reinforce the logic of this choice. Second, although Riddle 49 does not rhyme, Aldhelm was an innovator in the use of end-rhyme and used it some of the riddles of the Aenigmata, such as Riddle 22, which is fully end-rhymed. Sciscitor inflatos fungar quo nomine sofos. I ask the windbag scholars for my name. I wish now that I had talked to him about that half-line, but I suspect it was a reluctant compromise based on the difficulty of finding a third end-rhyme and a sense that the riddle needed more closure. I hang untouched by boundless sky or ground. As I survive both being scorched and drowned. Rendering the first line’s patulis fabricate metallis as “As pounded gaping…” was a significant decision. First, “As” captures the sense that the cauldron is in one condition now but could be in another condition at any moment. It is a recurring theme of the Aenigmata that wondrous changes occur in nature all the time, an observation designed to make the more challenging belief in the metamorphoses of Christianity more credible. I also think it is important to translate patulis as “gaping” in order to capture the Anglo-Saxon view of a cauldron was a symbol for Hell with gates gaping to welcome the masses of approaching sinners. That choice makes it easier to translate capax as “wide” instead of the musty cognate “capacious” that most translators have used. The second line presents the translator with the close call of whether to translate caelum as “Heaven” or the more secular “sky.” The evangelizing in this riddle is subtle and mostly implicit in the trope, so I chose the less religious of the two choices. In line 4 “various” for vario is seductive, but again falling for a cognate is a mistake in my judgment. The riddle is moving toward geminas (“two”) and a dual challenge in lines four and five, and “different” is less suggestive of “many” than “various.” While the “endure” of Stork and Pitman is more than philologically defensible, here the context pushes tolero toward the sense of “endure successfully” or “survive” in the way that martyrs of Aldhelm’s recent past survived flames in either a physical or spiritual way. Following the model of Symphosius, Aldhelm wrote a hundred riddles as well as a preface. I concluded that the Wilbur template (which I interpreted as required end-rhyme but no set rhyme scheme) worked well for the first ninety-nine riddles, but not Riddle 100 or the praefatio. The first six riddles begin in an extraordinary fashion overlooked by scholars. They are primal in that they ponder the world in a way largely stripped of both the classical and Christian tradition, and yet one senses Aldhelm pressing toward God in the manner of meditations of later medieval mystics. While concision and rhyme go a long way toward making a translation work as poetry, a poet’s perspective can also improve upon the meaning offered by a philologically driven translation. For instance, in the first line using “I participate” for the vague verb insto is unassailable philologically, but the line dies on the page. Rendering the beginning of this riddle as “I…participate” instead of “I share” reduces the emotion of the statement to something that sounds like an investor bloodlessly “participating” in a public offering rather than a spiritual person engaging in a revery. This view of the moon’s powers over the human body was not based on occult assumptions, but on the Greek medical tradition that assumed direct effects of the environment on a patient. Aldhelm takes advantage of Latin’s lack of articles here so that what is perhaps most faithfully translated as “a god” becomes ambiguous and could philologically apply to a unitary deity. Lapidge and Rosier translate it as “God,” Stork translates it confusingly as “god” without an article, and Pitman translates it most confusingly as “the God.” With great hesitation I followed Lapidge and Rosier because I think their choice best reflects Aldhelm’s intended (if somewhat deceptive) meaning. As often happens, the next riddle touches upon the same theme as its predecessor. By Riddle 9 the Aenigmata has turned from being a work of the heart to one more of the head; one can almost sense Aldhelm searching his arca libraria (the subject of Riddle 89) for inspiration. In Riddle 9 Aldhelm’s attribution of unusual properties to goat blood could have come from multiple sources, but his most likely source is Isidore Etymologiae 12.1.14-15—simply because Aldhelm went so often to that text for inspiration. Similarly, about a quarter of the riddles appear to rely on subject matters derived from Basil’s Hexaemeron or Solinus’ Mirabilia. As Aldhelm added riddles, they tended to become longer and more didactic. Particularly as he nears the end of the Aenigmata, the original mystical inspiration has given way to more intellectual and creatively forced riddles. Perhaps the low point is the last of the riddles of short-to-intermediate length, Riddle 99, which turns on a bad pun about an obscure figure in classical history that imitates similarly bad puns in Symphosius Riddles 25 and 32. The last Aldhelm “riddle” is hardly a riddle at all. Riddle 100 makes a significant break from the other riddles—not only is it longer at eighty-three lines, it has an extended and edgy exuberance influenced by the satires of Persius (who is clearly imitated in the praefatio to the Aenigmata) and perhaps Juvenal (Aldhelm probably did not have access to Horace’s satires). I struggled for a while thinking about the rhyme scheme for such a long poem, but then noticed that, unlike the earlier riddles, Aldhelm wrote Riddle 100 largely in couplets, often in sentences of two couplets. Accordingly, it seemed sensible to build on that feature of the text and render it in heroic couplets (combined with one triplet near the end). It is also a telestich—in other words the last letter of each line read upwards from the last letter of the last line also contains the same statement, which I translated (with the same number of letters) as “Aldhelm composed a thousand lines in verse.” The Aenigmata actually consists of less than a thousand lines, but millenis lacked the precision of our “thousand”—it often just meant “a lot.” Aldhelm also introduced his Carmen de virginitate with an acrostic/telestich combination. This kind of wordplay was popular in the medieval era, but it was was rare prior to Aldhelm, although there is an argument that Virgil inserted an acrostic into his Eclogues. In Christian poetry acrostics go as far back as Commodianus’ clumsy Instructiones, although the acrostics in the poetry of the fourth century pope Damasus are a more likely influence on the Aenigmata. Hisperic Latin was also a significant influence on the praefatio. With its wordplay, elevated vocabulary, and obscure allusions, the praefatio is in part Aldhelm’s effort to show that he could out-Irish the Irish at their own games. I have generally enjoyed the challenge of translating formal poetry into English formal poetry, but I found the challenge of translating the praefatio to be far greater than I anticipated—my wife says the month I spent on it was the only time she could remember hearing me cursing my work. I originally thought that I could do a blank verse line-for-line translation that would be an acrostic and a telestich, but that quickly proved impossible; I could only create a reasonable version of one or two of the first ten lines with all those constraints. Eliminating the telestich made my task easier, but it continued to be frustrating. I underestimated the degree to which my choices would be limited by restricting the vocabulary of the first word of each line; I even tried rewriting the 38-letter acrostic message in order to provide myself with more flexibility with my translation, but I had also underestimated how fortunate I had been to find an accurate rendering of Aldhelm’s message with the precise number of letters required. When I finished translating the praefatio I felt more unsatisfied than I had ever felt with a translation heading to publication. In places my syntax is awkward, my vocabulary serviceable but suboptimal, and my meter rough. At some point I started taking some consolation in the fact that, for all these failures, it was fairly mimicking the original text—Aldhelm made some of the same forced compromises in order to complete his task. For instance, the parenthetical at lines 4-5 awkwardly breaks a beautiful plea to God for literary assistance in the vein of earlier poets to the classical gods. Despite my frustrations with the praefatio, I enjoyed translating the Aenigmata more than any other text to which I have devoted my time. Usually I finish a long project with a sense of relief, but with this one I had a sense of sadness when I was done. Some of that enjoyment came from the mission—it was the first time that I had translated a text for readers who, as a practical matter, had no other way to experience it. Some of that enjoyment came from an affinity with the poet that surprised me, particularly as I considered his efforts to regain the inspiration that propelled his first six riddles. Perhaps the greatest pleasure of translating the Aenigmata came from the fact that doing the work well required a scavenger hunt through Anglo-Saxon life—from history to medicine to food and many other arcane topics. There was no commentary on the text, and many of the riddles had received little scholarly attention. I did not set out to write a commentary, but at some point I realized I needed to write one in order for me to understand and for readers to understand some of the poetry that would otherwise remain obscure. It was great fun, and I was sorry when it was over. I also feel blessed by a benefit I did not anticipate. I met the great poet and translator Richard Wilbur in 1995 at the first West Chester University Poetry Conference on Form and Narrative. I felt awed and inarticulate, and I am confident that I made no impression on him whatsoever. Such missed opportunities continued through other interactions over the years. Once I got past the shock of being called “young man” for the last time in my life, we had a long and friendly conversation about Symphosius and Aldhelm. He told me that he had finished translating all of Symphosius, but doubted that he could find a publisher—an admission that filled me with despair for my own literary future. Many of my friends doubt that I exercised self-restraint in this conversation, but I worked hard to avoid the faux pas of thrusting an unwanted manuscript upon a famous poet. As we finished, he really did ask me to mail it to him. Soon thereafter I received a lovely note about my work, and I then cravenly asked him if I could use some of that note for a blurb, to which he graciously agreed. The main joy of this project is that I bonded with two astonishing people—Britain’s first “man of letters” and America’s greatest poet-translator. 1) Juster, The Satires of Horace (University of Pennsylvania Press, 2008) and Juster, Tibullus’ Elegies (Oxford University Press 2012). 2) For the influence of Theodore of Tarsus on Aldhelm, see Juster, Saint Aldhelm’s Riddles (University of Toronto Press, 2015) at 76. 3) Thornbury, Becoming An Anglo-Saxon Poet (Cambridge University Press, 2014) at 139. 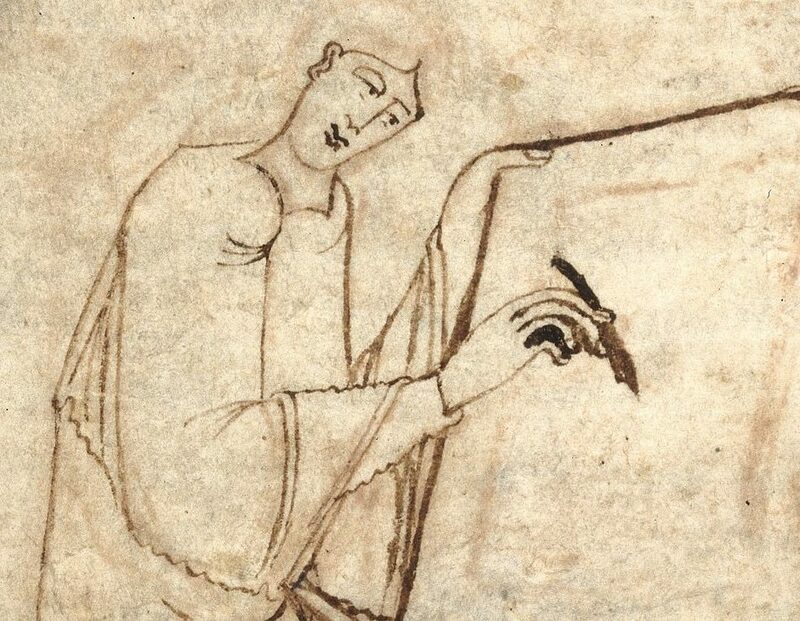 4) See Aldhelm’s Letter to Heahfrith in Lapidge and Herren, Aldhelm: The Prose Works (D.S. Brewer 1979) at 163; Stevenson, The “Laterculus Malalianus and the School of Archbishop Theodore (Cambridge University Press, 1995) at 10. 5) Lapidge and Herren at 7. 6) See e.g. Juster, Saint Aldhelm’s Riddles at 152. 7) See e.g. Juster, Saint Aldhelm’s Riddles at 123. 8) See generally Stephenson op.cit. 9) See Juster, Saint Aldhelm’s Riddles at 132. 10) See Juster, Saint Aldhelm’s Riddles at 74-75. 11) See Lapidge and Rosier, Aldhelm: The Poetic Works (D.S. Brewer 1985). 12) Stork, Aldhelm’s Riddles in the British Library MS Royal 12.C.xxiii (Pontifical Institute of Medieval Studies 1990) at 161. 13) Pitman, The Riddles of Aldhelm (Yale University Press 1920) at 27. 14) Wilbur, Collected Poems 1943-2004 (Harcourt 2004) at 168. 15) Hofmann, “Infernal Imagery in Anglo-Saxon Charters” (2008 University of Saint Andrews dissertation). 16) In this paragraph I have borrowed heavily from p. 88 of my Aldhelm book; all relevant citations are included in the note on Riddle 6. 17) See Grishin, “Ludis in undis: An Acrostic in Eclogue 9” Harvard Studies in Classical Philology 104 (2008) at 237-240. 18) For a brief overview of the history of acrostics in Latin poetry, see Juster at 78-79. Throughout this chapter I have freely cannibalized thoughts I expressed in my Aldhelm book and my January 14, 2016 talk at the offices of First Things.